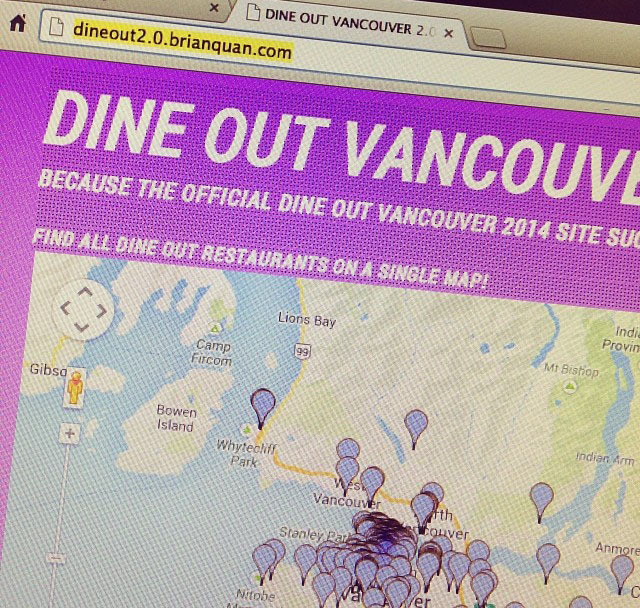 In Vancouver, we have an annual festival called Dine Out Vancouver. It's a foodie festival of a few hundred participating restaurants, offering special menus just for the festival. It's a great opportunity to try out new restaurants or go to some restaurants you would otherwise have not gone to. The official DOV site does has some useful features for choosing a restaurant - such as choosing by cuisine, price range, vegetarian or gluten free options. However it is missing some key features that that would make it really useful. In fact, in choosing restaurants to try myself, I became quite annoyed by the official site. I wanted to be able to browse a map to find a restaurant near me. As well I wanted to know which were the top restaurants to try. 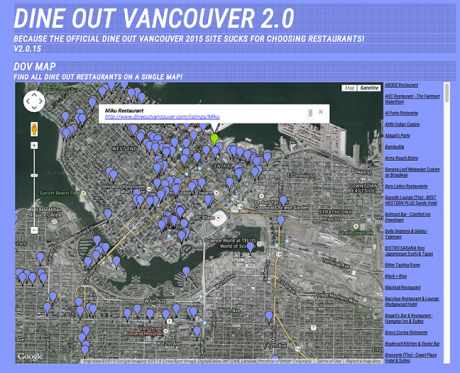 So my frustration led me to create DINE OUT VANCOUVER 2.0. DOV2.0 has all the participating restaurants on a single map for easy location based decision making. As well, it has an interactive grid of all the restaurants mashed-up with Yelp ratings and reviews. All of them linking to the DOV menus. It was more or less created for my own purposes, but others have found it quite useful. In the few days I have had DOV2.0 up, I've had 500 views from 340 visitors. On observing a senior use a Compass Card on one of the bus readers. She couldn't tell or did not notice if the tap worked. She held it up to the reader, slid it around a bit, waiting for something. She then assumed that it must be fine and just continued onto the bus. One reason she couldn't tell might be because her card can end up covering part of the screen. 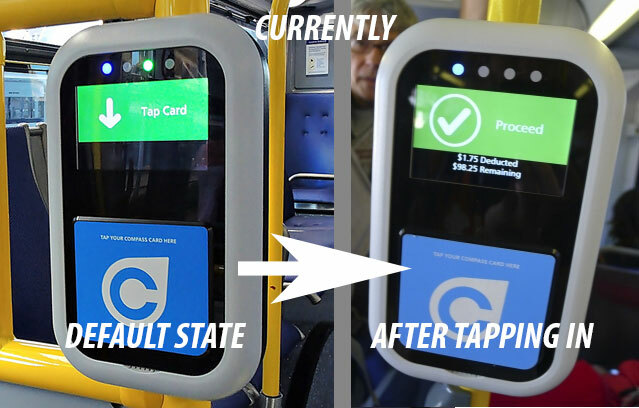 But the main reason I believe, is that the default start screen, which prompts you to "Tap card", shouldn't be green and then still be green after a (successful) tap. (It does change red, if the card was misread). In the half a second it takes to tap a card and board a bus, while other people are waiting behind you, with an old immigrant lady, with limited English and a different generational tech experience - you want an interaction with the interface to be as understandable as possible and not prone to "user error". The Default screen should be of contrast to green (I would suggest white or light blue to go with the Compass branding) and then change the screen to green on tap (as the color green is synonymous with good, go, or complete). As well, the beep on tap from the bus readers needs to be MUCH louder, as it is barely audible (should be loud enough and at a more noticeable frequency to be used on a noisy bus or station). So this summer I had the pleasure of helping organize for a friend, an amazing Canadian artist, her first solo art show, showcasing 18 years of artwork! Sze Yun Lo's body of work experiments with a variety of mediums, from the traditional watercolors of the Lingnan style, to more western mediums of acrylics, and even designed products. She specializes in a style known as Lingnan - she is the youngest in Vancouver and one of the last of our generation that we know of still practicing the Lingnan style. She has been practicing art for 18 years and apprenticed under four local Chinese art masters. She was the last apprentice of Letty Shea (Lingnan School), and also apprenticed under art masters Mah Zi Ping (Lingnan School), Huang Su Ya (portraiture), and Kai Chuen Kam (Chinese calligraphy). Being a contemporary artist, she has experimented and mixed western mediums and styles, to push her art in unique directions. Unique as an artist in Vancouver - SzeYun brings a dying traditional Chinese art form, into a 21st century fusion. But just like Vancouver, her work is a mashing of East to West. The exhibition was on July 13th, at the Orpheum Annex. Designated pieces of art were also being auctioned to raise funds for selected charities. please check out her Online Catalogue here!